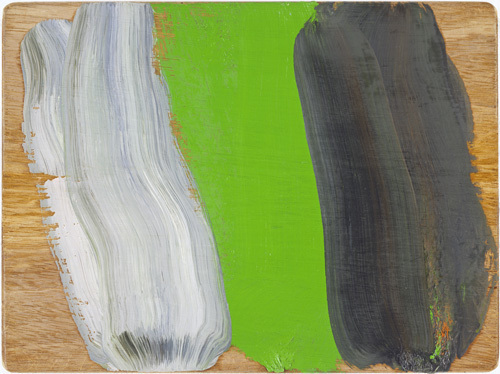 Howard Hodgkin, After Ellsworth Kelly, 2001, oil on wood, 8 7/8 x 12”. Although one of Howard Hodgkin’s pictures bears the mawkish title Home, Home on the Range, 2001–2007, his paintings of the past decade suggest that home—broadly conceived as the ground of painting itself—is squarely in exile. To this end, Hodgkin’s recent concerns orbit around his varied manipulations of painterly supports: unconventional plywood surfaces, paintings made in flea-market frames, and endless riffs on framing as a delimitation of material and conceptual territories. Rather than evincing the overblown critical rhetoric around mnemonic recollections and painterly reconstitutions of emotional events, Hodgkin’s work wrestles with the confines of abstraction. In a token image—the diminutive Leaf, 2007–2009—a muscular brushstroke thus uncurls from upper right to lower left and back again, elbowing the edges of its frame, as the artist virtuosically navigates the ever more contracted field of abstract painting. Then there is After Ellsworth Kelly, 2001, where three columns of paint, each composed of two monstrous vertical strokes, shimmy down a well-used cutting board. Tattooed with blade marks, this gouged expanse secures the notion of Hodgkin’s surfaces as battlegrounds, where in this instance he grapples with the long tradition of the palette knife as a tool of abstraction. Increasingly unprimed, often dazzlingly striated, Hodgkin’s plywood veneers shape the rippling logic of a work like Snake, 2006–2008, where a serpentine stroke of cadmium red light wobbles across a grainy field, surrounded by the artist’s signature dabs—jaunty red markings that read like oily kisses on the wood—and several concentric painted borders, all bounded by a hefty wooden frame, mounted backwards so that its pocked reverse faces out. Once more painting on the rear of found supports, the artist turns his back on his audience—and invites them to do the same: creating not a vista outward, but a view inward, or a glimpse of the back of the mind. In this art of slow brushstrokes and long pauses, Hodgkin hails his viewers as oriented, grounded participants, provocatively nudging their sense-making impulses with abstract images foiled by deceptively deictic titles such as Spring Rain, 2000–2002; Lawn, 2009; and Blood, 2005–2010.